If you don't already, would you like to learn how to love salad? And I don't mean just like it, I mean really really love it. You know you want to..... cause eating more of this stuff is a guaranteed way of losing weight and maintaining well being in your life with very little effort!!!!! Well I'm going to give you some of my secrets as to why I'm known as the salad queen in my circle. If you think I sound cocky, you may be right, but ....I promise you I'm not. It's the truth and I just want to share with you my secrets as to how you will be wanting to eat lots more of this. The first secret is Danish Feta Cheese. It's soft, creamy and resembles goats cheese, but is alot easier on the family food budget. I know,......you are asking...... You have lost 12 kilos since September and you ate this stuff almost every day? Well I would have to answer...... a big honest 'yes'. You only need a small amount...say a small knob the size of a 50c piece or for my American friends a small circular knob with a circumference of about 1.5 inches. It crumbles beautifully and is sooooooo flavoursome. I put this in all my salads and believe me it is such a hit, that when ever we go to someone's for a bring a plate dinner, I am always asked to bring the salad. Take one ingredient from my base list, 4-5 from my fillers list, one from my sweet list and one from my texture list, to build a fabulously healthy and good tasting salad. And please, please please don't forget my 2 secret ingredients as discussed above as they will be the things that leave you wanting to make this every day. This salad needs to be eaten with lean protein. 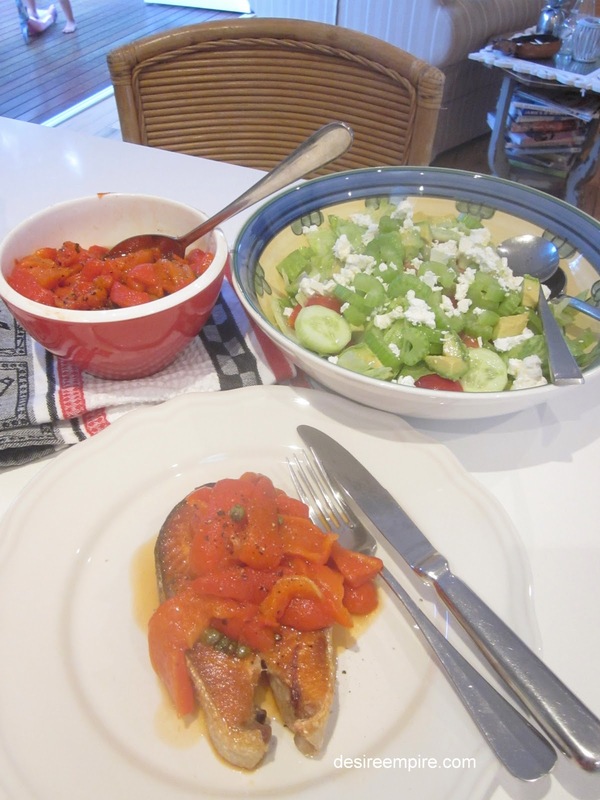 The CSIRO ( The Australian Government Science Agency) recommends 250 grams for dinner and 150g for lunch. So here's was what we had last night as our choice of protein, Atlantic salmon. I can guarantee you that with every meal I serve up to Mr Beach House he can be heard to say....'What sauce goes with this Darl?' I get so insulted, as he is in the habit of adding tomato sauce, mustard or soy to everything....so the other night I snookered him before he could reach for the bottle. 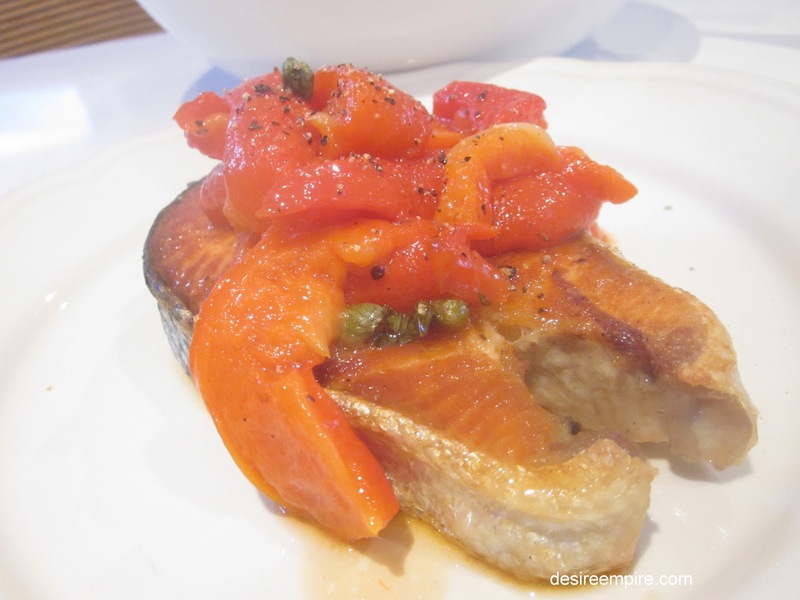 I topped the salmon with this red capsicum relish, by Margaret Fulton. You can use this to compliment any meat and it's fabulous. Remove from oven and allow to cool before removing the skin. 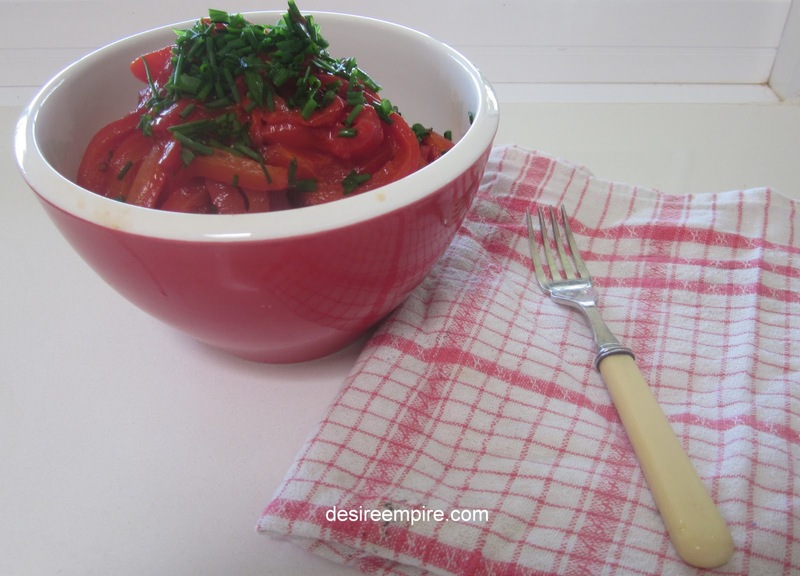 Cut into strips and dress with 1 tbspn of Extra Virgin Olive Oil, 1 tblspn of vinegar. One tspn of rinsed capers and a small handful of chives or basil, finely chopped. Salt and pepper to taste. Mix well to combine and enjoy with any meat. And now the real reason why you clicked on this post to begin with....Here are 5 more easy to achieve tips, to help you maintain a healthy weight. Go here to see my first 11. Don't eat your children's leftovers. My mum always said that was how she put on weight. Small changes can make a big differences. Start by doing things that are achievable...like eating salad instead of fries with your main meal. And remember your body will notice the change within 24 hours, even if you don't. Move more....It's an oldie but a goody...take the stairs, put on your favourite CD and dance around the house with you kids, dog or a friend. Don't try to park right at the front door of your destination. Park back a little so, you have to walk a little further. Hang out the washing, instead of putting it in the dryer. If I am going to a party on a Saturday night, I have dinner first, that way, I am not going to be starving when I get there and eat all the 'naughty' things that are on offer. Change out one of your red meat meals for the week to fish. Now this is controversial.......but if your husband/partner hits on you and you can't be bothered, think again....not only will it make him like you more, but think of it as a work out. Personally, I use the time to do my nails. Just kidding!!!!!! So I hope you are laughing now and not thinking I am a terrible person. Go on give all this well meaning advice a go......You won't regret it!!!! This was a great post! I don't think I congratulated you on your weight lost, but that is awesome! I used to always say I hated salad, but then I realized that yes most (I say most because I do really enjoy newman's own) commercial salad dressing is terrible and a salad doesn't mean it has to be just lettuce... great tips! That's so true about Newman's. It's the only one I can have. Great man great chef!!!! I also love your tips and recipes. We do have a delicious Greek vinaigrette here that I can't give up, but so many others have sugar and preservatives, you are better off making your own. Thank you for the wonderful tips and recipes! I'm not sure we can get Danish Feta around here but I'll try! (isn't that sort of a food oxymoron...Danish Feta? LOL!). I love your salad "system" as that's really what it is and I love that it's not just one recipe. You gave us so much more! I'm not really a salad person but I love vegetables so go figure. I love the salads in the restaurants but I can never get mine to taste that way so I'm hoping this will help me. Also, the only fish around here are frozen unless I go to the lake and catch some but since I don't know how to clean them that might be a problem so I'll go frozen! For now anyway! I am as far as you can get from an ocean I think! LOL! This was a wonderful post and again thank you so much! 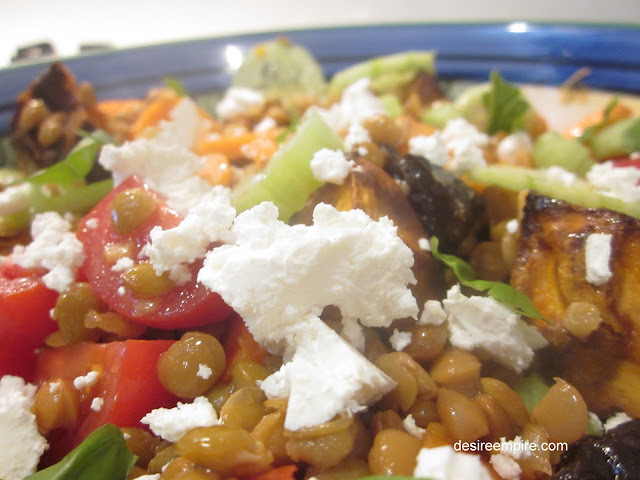 the salad sounds great..love all those ingredients and lentils or other legumes added to salad! keep up the great work! Send some warm summery beachy-breezes on over to Normandy! Buuurrrr! I adore Danish Feta! It really is an extremely versatile cheese. And, as you said, far more reasonable priced than chevre. 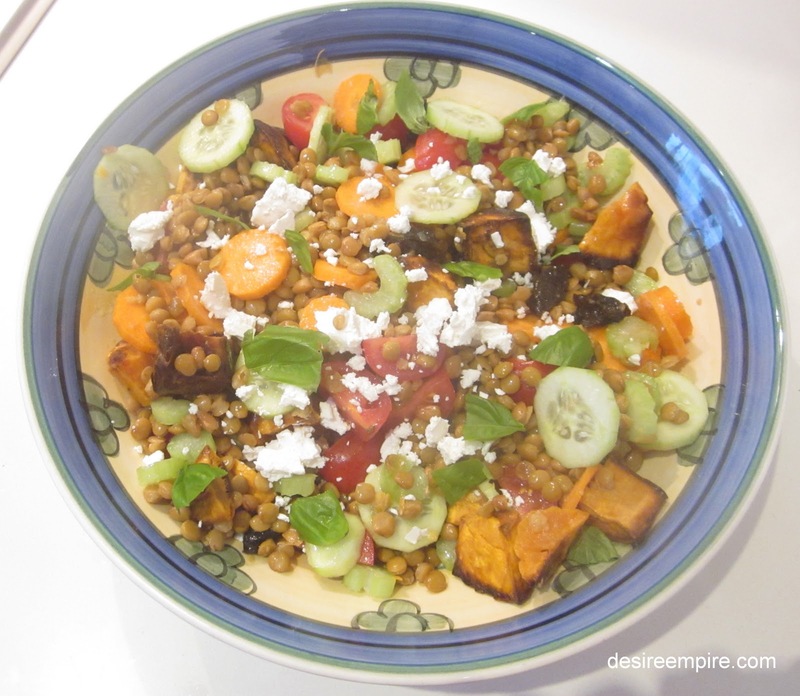 I used to buy Bulgarian Feta but it has been extremely hard to get hold of lately. 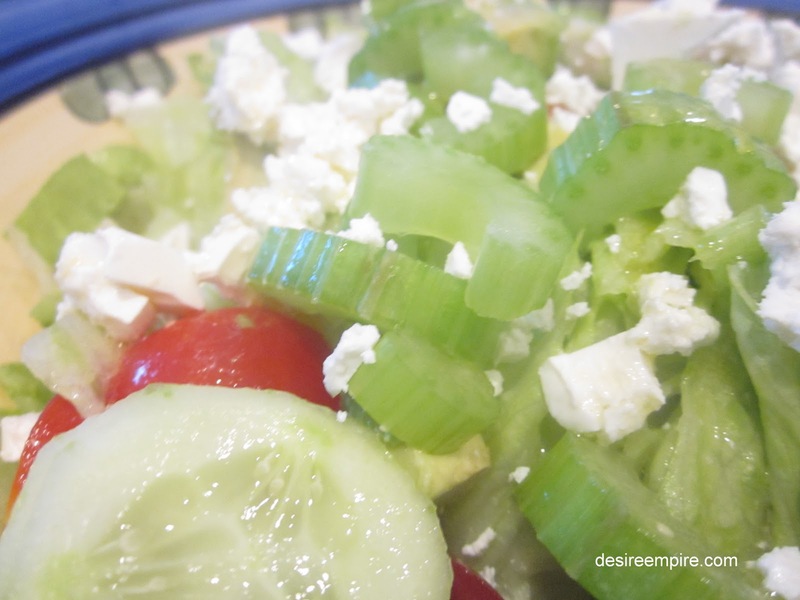 If you love Danish Feta, you'll crawl over glass for Bulgarian! It's only a couple of dollars per kilo dearer than the Danish. Sam I Am, Woolies Deli's sell Danish feta. I use it in quiches and it adds an excellent bite to Macaroni cheese. DE, have only recently discovered you. Enjoying your blog very much. Looks like some very interesting recipes. Great tips. Looks delish. I stopped over from Honey's Potpourri Friday party. Have a great Sunday. Looks like a delicious way to lose weight! (something I'm struggling to do myself) 10 gone.....and MANY more to go! Just going through all of your recent posts & this one caught my eye. I would eat more salad if I could have one of yours. They sound so good. I love salads! Should make more of them, though. My favorites are (1) with egg, 3-beans, garbanzos, and lots of shredded cheese!, and (2)the kind with walnuts and grapes! Yum!